Rains have a tendency to f*** up bikes and cars and anything that moves around be it either on legs or two wheels or four wheels or any number of wheels. Fortunately we ride a bike that is easy to maintain. rains are gonna be hell on the oils...old oils, that are more than 1500 kilometers old will already have moisture in them. The rains will add a lot of water to the already thin oil. This means your bike is not dissipating the heat like it should through the oil. Plus at some time or the other, water is also passing through your oil pumps, causing corrosion. the solution...change the oil....I went for MITSUBISHI ORBIS GRAN 20W50 SYNTHETIC OIL, which is original Japanese oil by Mitsubishi, marketed in India by Tide Water Oil company. Comparing it price wise to any other oil, it costs 100 bucks a liter whereas the castrol or any other oil will be around the same rate give or take 20 bucks. The viscosity of the oil is something to talk about. It’s green in color and it’s relatively thicker than any other 20w50 oil I have ever laid eyes on including shell. That means your pump pulls oil with good pressure, ensuring it goes into every little place it should and then due to its thickness it also stays in some places which otherwise would be home for moisture and then corrosion. Thus it is also an anti corrosive. For the clutch I have been using atf or 10w30 oil which is thin like water. The main purpose of the oil in the clutch case is to lubricate the primary chain and dissipate the heat given out by the clutch plates, the clutch center, the primary chain and the magnet which charges the battery. If we use engine oil or any other thick oil in the clutch case the oil has a tendency to get inside the clutch plates and cause the clutch to slip thus reducing the bite we need for good running. The thinner oil also does the same but because it is less viscous it doesn’t stay there for a long time and does not cause slipping of the clutch and even if there is some slip it is negligible. If you have been using engine oil in the clutch case also, change over to the 10w30 or atf. But make sure to remove all the clutch plates, friction plates and wash them with petrol to take off any old oil from them and then put them back dry without applying any oil on them like the mechanics do. While you are at it, check the clutch plates and friction plates and the clutch center liner for wear and tear. Replace it if necessary. A slipping clutch is dangerous on wet rain soaked road. Tappets on the loser side are always a boon for us riders. So if the noise doesn’t bother you don’t worry about the tappets. Just make sure to see that they are not too loose so as to jump out of their settings and leave u stranded in the middle of a downpour. For the guys with point condensers make sure to clean and grease up your point plates and the auto advance mechanism behind the point plates. Clean up the points, set the gaps as per your settings and put an ambassador fuel lid rubber over the point cover so as to prevent moisture or water drops from going inside and causing problems. Change the air filter too. Old air filters are already dirty with the pounding they have taken in the dusty summers. Add moisture and water spray from the roads to it and your bike is literally suffocating. Let it breathe. An air filter will only cost you 30 bucks. If you haven't changed your control cables, I would insist you to change them now...but before changing them, a small discomfort to go through...oil them yourself...take a small plastic bag and cut a hole the size of the diameter of the control cable on one side of the plastic bag. Slip one end of the cable through it and tie it securely in such a way that the cable doesn’t slip out of the hole. Pour engine oil or any other lubricating oil in the plastic bag to a level enough to submerge the end of the cable inside. Hang this whole contraption at some place where nobody interferes overnight. The oil will seep through the outer and lubricate the whole inner cable and form a thin film of oil throughout the length of the cable. Be sure to put something on the floor to avoid oil drops there. Do this to all cables. Accelerator, clutch, front brake (for those with drum brakes), decompressor and meter chain. Try to get the clutch and brake lever covers...like the ones offered on the Honda splendor or the Kawasaki bajaj bikes to prevent water from getting into the cables. The fork oil, as required can be changed once before the monsoons and once afterwards. The usual market fork oil is 10w30 which is too thin for the bullet forks. I mean the your forks will work super smooth but every time your bike goes in and out of a pothole or through bumps at speeds there will be a loud "khatt" noise which is very irritating and to some, fear inducing. Some mechanics use engine oil mixed with grease and some use thicker oil. I use engine oil and 90w gear oil mixed in equal proportions. It works better, though the shock absorbing is a bit hard but the forks do not bottom out. For the steering, nobody is going to go through the trouble of dismantling the whole assembly, but if you have the time to do it then nothing better than that. Remove the full assembly including the front forks and all; remove the t, the steering cones and the bearing balls. Wash everything in petrol or kerosene to remove the usual muck from it and dry it. Check if the cones need replacing. If there r small indentations in them and your steering has been acting funny...like being hard to turn and all, change them. You'll also get new bearing balls in the set. If the cones are ok, fit them back. Use the same balls if they r in good condition, if not get them from any cycle wallah. They cost 10 bucks for a packet of 100 balls. The size is 1/4th inch. Pack the cones full of grease, put the balls in, and pack some more grease on it....while sliding the t in use lots of grease on it too...fit everything back. While fitting the forks, be sure to apply some grease, a very thin layer to the part that stays exposed to the weather and fit everything back. That will take care of the forks and the steering. Drum brakes, especially the front ones have a tendency to lock during the monsoons. This usually happens because of the rust buildup in the cams that operate the brakes and the brake cables. Since the brake cable is changed, that possibility can be eliminated and the main culprits will be the cams. Open the hub and dismantle the full brake setup along with the liners. If the liners are worn, replace them. Be sure to get them shaped according to the shape of the drum for efficient braking. The riveted liners are a good option. And also anl brand liners are pretty good and long-lasting. be sure to polish the inside of the drum and the liner surface with either 80 or 120 number emery paper to roughen it out a little and add more bite to braking. Clean the cams in petrol or any solvent and add a thin layer of grease and fit them again. Assemble the whole setup and adjust brake as per your previous setting. I prefer my front brake a little on the fading side in the rains. Sudden braking may make the bike skid and cause injury to both the rider and the bike. Use the front brake only to slow down and the rear brake for final braking. Do the same cleaning things with the rear brake also. While you are at it check the wheel bearings for play or damage. Even if they appear ok be sure to pack them with grease and put new oil seals wherever necessary. Also check the rear sprocket bearings and the shape of the sprocket teeth. One of the parts of the bikes that will be as exposed as the chrome to all the elements of nature is the chain. It is also the main ingredient of the whole bike. No chain no ride. Remove the chain, wash it in some solvent and degrease it properly. If possible wash it in solvent, then wash it in a detergent and wash it in solvent again. If you have time, grease up your chain the nandan way. Take a pan and put a couple of tablespoons of grease in it and let it melt. Then put the chain in the grease and add grease on top of it so that the chain soaks in the grease. "Cook" the chain for half an hour or so, so that the grease penetrates into every link as much as possible. Then put the chain back onto the bike. This chain grease will last about three months. Also take care to add a dash of grease to the chain after fitting it. Keep the chain loose to avoid damage to your sprockets. Usual clearance is about 1/2 an inch to 3/4th of an inch. But 1 inch will also be ok if you do lots of riding with loads or pillions. Incase you don’t have time for the cooking thing get the mol coat spray for the chain. Clean the chain like advised before, put it back on the bike and rotate the wheel as you spray your chain with the molly graphite spray. It also has good penetrating power and will last a long time. The only thing that’s bad about this is its cost. the spray made by gulf or halocline will cost about 400 bucks but if two of you get together and get the spray, the cost will be distributed. The things that keep you on the road. The shoes of the bike. How would you like to go out in the rains with sandals that have holes in them or those that don’t have any grip? Maybe u'll slip somewhere and sprain an ankle or a hand. In worst cases, you may have fatal injuries too if you are not very careful. Same is the case with tires. If they have less than 2mm of tread left change them. If you cannot change them right now, under inflate them. I have been using 20 for the front and 25 for the rear tire since a very long time. Good grip although it’s a bit tough on the fuel efficiency. While you are changing tires, go through your spokes. If they are broken, replace them. Through your wheels, an out of alignment wheel will make riding on wet roads that much dangerous, even more so when cornering. If you can spare time, paint your insides of the rims with aluminum paint or red oxide primer to prevent rusting. Tubes with more than 3 punctures should be changed promptly. First of all, get rid of the engine kill switch. It is the culprit in most cases of the bike not starting during monsoons. Use your decompressor to start or shut off the engine. Check all the wiring for kinks or cracks. Grease up the battery terminals, check the battery electrolyte level and top up if necessary. If your battery is a goner, go for the dry maintenance free battery. Clean all copper connectors with the sandpaper or if possible with some electric contacts cleaning spray. Get all the connections that have been made afterwards, like horns, auxiliary lights, etc. soldered and then taped properly. Change all the non working bulbs and keep spare bulbs with you at all times. Check the headlight bulb. If it is going black, change it. If you have the time for it, go for a halogen, a 60/55 watt bulbs will do wonders to the night rides in the rains. Sealed beams are one's own preference. I use an ambassador nova clear lens sealed beam which has exceptional throw and a reasonable spread too. Thunderbird owners don’t have to worry about the headlight bulb wiring, but to others I would suggest switching over to 3 pin holders available for cars, in case you are using halogen bulbs. They fit very nicely and they are made of thicker wires which help by not heating up the bulb's base and indirectly affecting the efficiency of the bulb. Use wd40 or any moisture repellent spray on the indicator and headlight switch to drive away the moisture. Cover the horn relay properly to prevent water from entering it. I don’t know about other bikes, but with the standards running a fuse in the wiring loop, carry lots of spare fuses of correct value. I have removed it and use the wiring directly. A blown fuse will keep u working up and down your bike for a long time before you realize what is going on. For those with split seats, take care that the water does not go down into the rectifier, regulator, flasher unit or the ignition coil. Even otherwise, put a protective plastic over all these things to prevent entry of water and causing a short-circuit or failure. 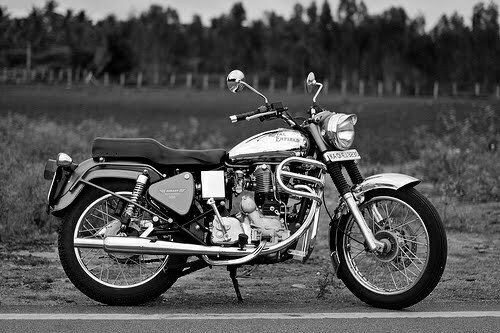 The beauty of the bike lies in the chrome. Lots of anti rust solutions are available in the market and they do their job quite decently. Aluminum should not be covered with anti rust. It will absorb the color and will turn yellow. So you will have to get it rebuffed after the rains. I personally don’t use any anti rust except grease and that too on the front and the rear wheel rim. Opinions vary in this aspect. Some people also prefer to spray burnt engine oil thoroughly on the chrome. Some use the yellow varnish available in the market and some use grease. It’s entirely unto you. 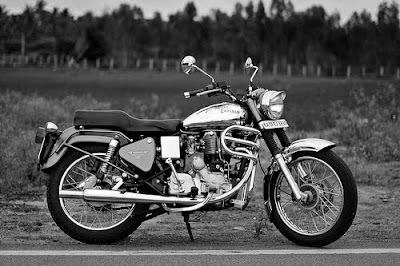 Some may even elect to get the bike rechromed after the monsoons. This is also a good option, except whenever you rechrome, the lifespan of that part goes down considerably. Wash your bike with a decent shampoo and polish it once every 15 days or so. That is probably the best care for paints. If your bike is Teflon or polymer coated, nothing better than that. Any scratches in the paints should either be touched up or covered with auto primer to prevent further damage. If your gears stick when you are doing a high-speed run and trying to overtake traffic on a single lined piece of tarmac, just imagine how hair-raising it can be. Get it checked promptly and do the needful. If the grease or oil level is less, top it up with 85w140 differential oil or straight 140 oil. The usual way of the mechanics is using a mixture of grease and engine oil but the above mentioned oils are way better than that. The problems in rains, most often than not with a stranded bike are either shot plugs or shot plug caps. Keep a spare plug handy always, no matter how small the ride is. The metal plug caps on the thunderbirds are major problems and they short out more often than not. Get the Honda caps made by Swiss or minda which are black plastic. They also have a rubber sealing ring on both the plug side and the coil side which does a decent job of keeping the water out. Keep all oil levels in check during the rains. When washing the bike, pay special attention to the fins on the engine. They are the only way your bike dissipates all the heat. So if there is mud accumulating on the fins, it will hinder the dissipation process. In bad cases your bike may also overheat. Check all bushings and bearings once in a while. Check the rear shock absorber rubber bushes for damage. If they look torn, change them promptly. Check the Cush rubbers of the rear wheel; change them on the slightest hint of damage. Check, tighten and torque all the nuts and bolts of the bike once in a while. Check the t for play and tighten if necessary. Change the cones if necessary. Use lots of grease wherever necessary. Replace rusting or missing nuts, bolts and other fittings. Clean your carburetor once to remove any water that may have accumulated in it with carb cleaning spray. Replace the carb packing while you are at it. Change the carb manifold rubber if it’s torn. For new model electras, thunderbirds and standards check all connection rubber hoses for air filters. If they are torn, replace them asap. Better still convert to the standard air filter. Keep a small basic toolkit handy always. Also keep a roll of insulation tape with you. A small but comprehensive first aid kit is also a good thing to have around. A spare headlight bulb, a brake light bulb and a sparkplug are also recommended. Thank you very much for these tips. I am going to own a 2007 model Standard 350 which has run around 8K kilometers. Is it okay to use a Synthetic oil like the Mistubishi one you have specified in this post at this point of time? What are your suggestions to check before I get the bike from previous owner. Bike seems to be moderately maintained. Do I require to give it a full service before I start using it? 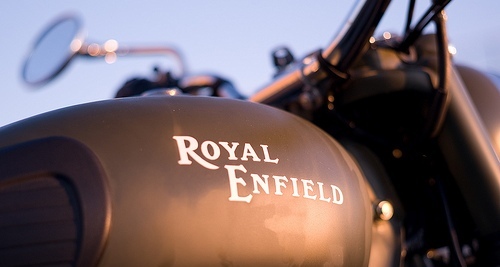 @ follow Used motorcycles buying tips mentioned in this site ! !